I've written before about how much we love books in this house. River is no exception, he loves being read to and is loving doing a little reading on his own. Therefore, I was excited when I was recently asked to review a few read-aloud classic Peter Rabbit books with River; The Tale of Peter Rabbit and How Peter Rabbit Went to Sea, both re-published by the Kinder Cottage Publishing Company. These books are updated versions of the classic Peter Rabbit books written by Duff Graham for the Henry Altemus company. Each of the books is a beautiful, small, hardcover book, measuring about 5" by 7". The Tale of Peter Rabbit is 64 pages long and shares the story of a naughty little rabbit, Peter, and his adventure in Mr. McGregor's garden. Poor Peter disobeys his mother, travels to the garden, gets lost, and encounters Mr. McGregor, who tries very hard to catch him. How Peter Rabbit Went to Sea is 64 pages long. In the book mischievous Peter finds himself a few more adventures, ending with his journey aboard his soap box sailboat with an apron sail, complete with meetings with a whale and a seagull. The books have been adapted and modernized by changing some of the outdated language from the original stories to more current wording. The full-color images within the stories are original and are very eye-catching and appealing, and gave River and I an opportunity to think and talk beyond just the story we were reading. I read both of these books to River in one sitting. He enjoyed them very much, once he knew that Peter was going to be alright (poor Peter finds himself in some awfully suspenseful situations that it really doesn't look like he'll find a way out of and River was quite worried about the young rabbit). A family friend, who is 7 and has just finished first grade, picked up the books and read them all by herself from cover to cover. Most of the vocabulary used is one and two syllable words, perfect for young readers. She enjoyed the stories very much. The books present a good opportunity to talk to small children about following rules and making smart choices. Peter's experiences give an example of why listening to your Mama is important, what happens when you don't follow the rules, what Peter should do next time he finds himself in a situation where what he "wants" to do isn't exactly what he should do, and even why the "buddy system" is important. Most kids have those moments where they'd rather head on over to Mr. McGregor's garden for a snack than obey their Mama and play in a safe area, it's our responsibility to teach children that listening and obeying are important, and these books provided a great introduction to the subject. We enjoyed these stories. These classics are a nice addition to the bookshelf, especially for just $4 each. 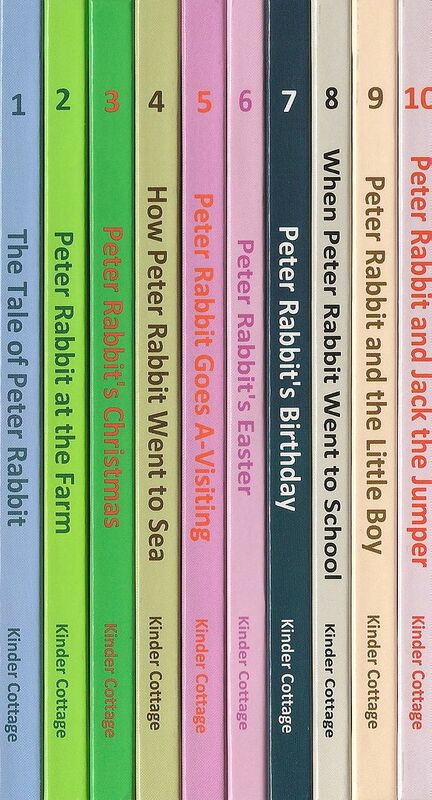 These tales, The Tale of Peter Rabbit and How Peter Rabbit Went to Sea, are available, along with many other titles in the same series, from Kinder Cottage Publishing for $4 each and are geared towards kids ages 3-9.